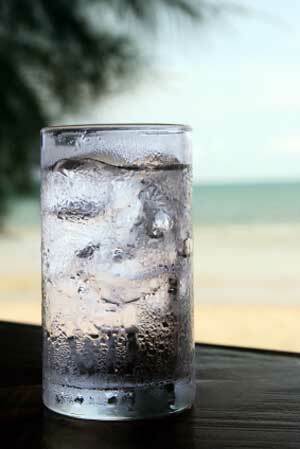 Ever been tempted by an ice cold glass of water? Probably not, right? If we were parched in the desert, a glass of water might be a temptation for us. But, we live in a "land of plenty" where water is abundant and free. Water is good for our bodies. We could say "Water is essential to our bodies to live." The Bible says in Jeremiah 2:13 that God's people have forsaken him, the fountain of living waters. Here's something to ponder. Why aren't we attracted to or tempted by things that are good for us? I need to drink water. Dehydration causes kidney stones. It seems so simple. Drink water, avoid kidney stones! I do well for a few days and then I'm off the wagon again. I don't really like to drink water. I can drink plenty of Coke and Tea though. The bad drinks seem to call my name from the grocery shelves. I am never beckoned to the water aisle by my own persuasion. James 1:13-14 says Let no man say when he is tempted, I am tempted of God: for God cannot be tempted with evil, neither tempeth he any man: But every man is tempted, when he is drawn away of his own lust, and enticed. So, there's the answer. We are tempted by our own lusts. I like Coke, it's a lust and temptation for me. Wouldn't it be amazing if good things called us to partake of them? God does! He offers the water of life freely. Have you ever noticed once you start doing things that are good for you, you begin to crave them? The more water you drink, the more you find yourself reaching for it....over the Coke! God is the same way. Once we choose him, we look to him over other things to help us and satisfy our souls. Our conscience or the Holy Spirit helps us choose God's ways. I'm thinking I need an accountability partner to make sure I drink water and eat good food especially since broccoli and exercise will probably never tempt me! It would be totally great if we were tempted by good things. Life would be so...well easy. Then perhaps we wouldn't (think) we needed a Savior? IDK The older I get, the less I know. Good post! hahaha I agree with you, the older I get the less I know or....the older I get, the less I want to know! lol Thanks for stopping by.